The perfect meat to bread ratio. Of all the great delis in Metro Detroit, Deli Unique in West Bloomfield has always been the deli of choice for my family. This is due, in no small part, to their delicious corned beef. They have a pretty big menu, but it’s the corned beef that keeps us coming back. 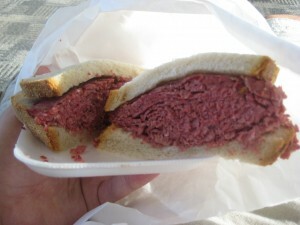 As always, I made sure to get a corned beef sandwich with simply beef and rye bread. Rather than get regular corned beef, though, I like to get it lean at Deli Unique. I’m not sure what they do there that is different from everywhere else, but when you get lean corned beef at Deli Unique, there is no loss of taste or increase in dryness that usual results from a loss of fat. Because of this, I really have no need for condiments on this sandwich. I also have no need for vegetables, which would ruin the experience entirely.